Sat Navs keep you on the A1 and bring you off at the A659, through Collingham. 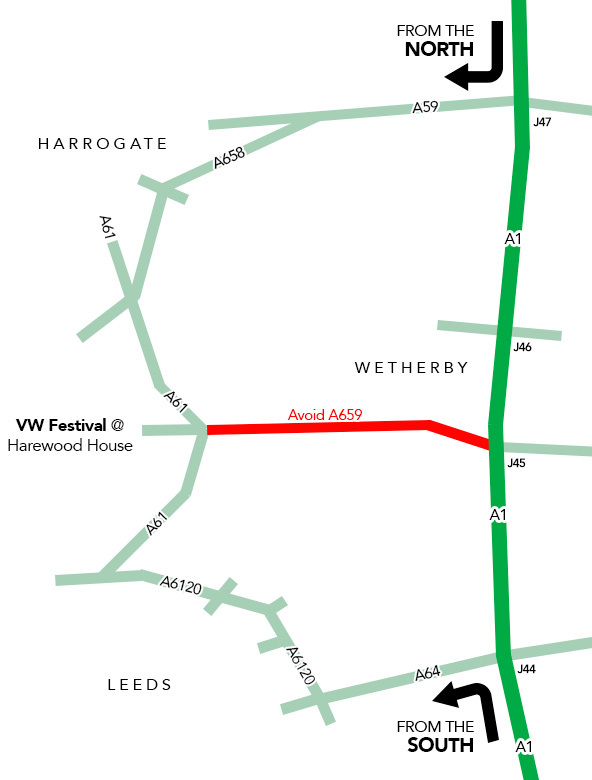 This route gets extremely congested on the show weekeed, so we recommend using the A61 Leeds/Harrogate road. The routes are slightly longer, but you will spend less time in traffic. Exit the A1(m) at junction 47 onto the A59 to York/Knaresborough. Follow the A59 across one roundabout. At the second roundabout go straight across onto the A658. Follow the A658 until you pick up the yellow event signs. These will route you through Pool in Wharfedale to end up at the correct gate of the Harewood estate. You can either come off at Junction 42 onto the A63 Leeds/Selby, or Junction 44 onto the A64 Leeds depending on where you are coming from. Exit the A1(M) at junction 42 onto the A63 and follow this road until you reach the Leeds Ring Road / A6120. Follow the A6120 until you reach the roundabout where it meets the A61 / Harrogate Road and follow it for 4 miles. Harewood House will be on your left hand side. Exit the A1(M) at junction 44 onto the A64 and follow until you reach the Leeds Ring Road / A6120. Follow the A6120 until you reach the roundabout where it meets the A61 / Harrogate Road, take that exit and follow the A61 for 4 miles. Harewood House will be on your left hand side. Arriving from Hull Ferry Port? Harewood is only 65 miles from Hull ferry port.